I am happy to report that the sample I grabbed was very, very nice! In two days I will dry hop with an additional two ounces of Centennial hop pellets. I will hold the temperatures at 63 degrees F for 5 days after the hop additions and then crash it to 34 or 35 F to clear everything up. I still have some decisions to make. When finished – should I fill two of my 6 L Tap-a-Draft kegs and bottle the rest, fill one 6 L keg and bottle the rest or bottle all of it? So many choices! The best part of the decision – whatever I choose it will be drinkable and sharable! 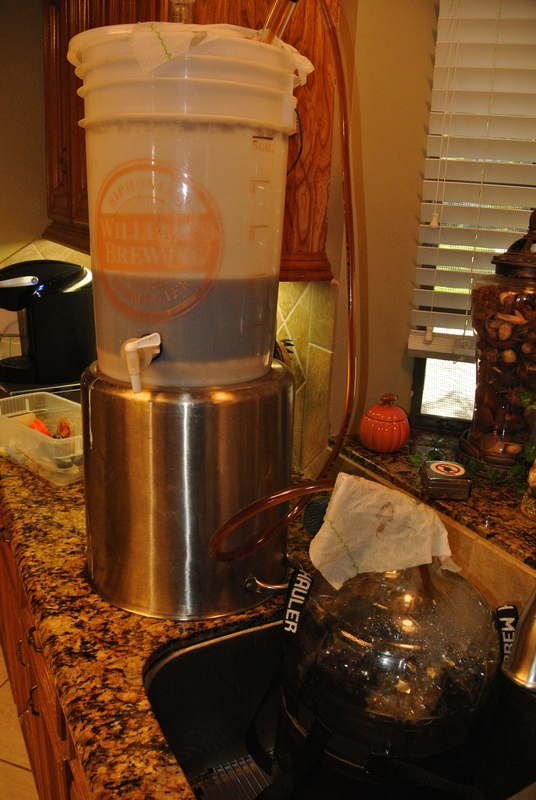 Making the transfer – primary fermenter to the secondary. Mother Nature and gravity make the siphon move the beer! Last night I picked up some inspiration for a new batch of beer. I am in Bakersfield working this week. At dinner last night my workmate ordered Pumpkinhead Ale from Shipyard Brewing Co., Portland Maine. Although I didn’t drink it I did enjoy the aroma- wow! Instant inspiration. It seems a little late in the year to brew a pumpkin ale but I have a plan! Others in our dinner party drank the 805 from Firestone Walker – Paso Robles CA brewery. Great easy drinking beer. Last fall my wife decorated the house with several “Cinderella” pumpkins. They really are, Rouge Vif d’Estampes. variety. Great for decorating and excellent for cooking/eating and very difficult to carve. They store very well. Last December I cut up and roasted one such pumpkin. I had enough puréed pumpkin for multiple loaves of pumpkin bread and a batch of pumpkin ale! The puréed pumpkin also freezes well. The beer aged nicely and at 10 months the last few bottles were excellent! I am inspired to repeat the effort. I took good notes, bought supplies from our local store so the follow-up effort should not be a problem. Brewing day will be post Thanksgiving but I promise to capture the effort! 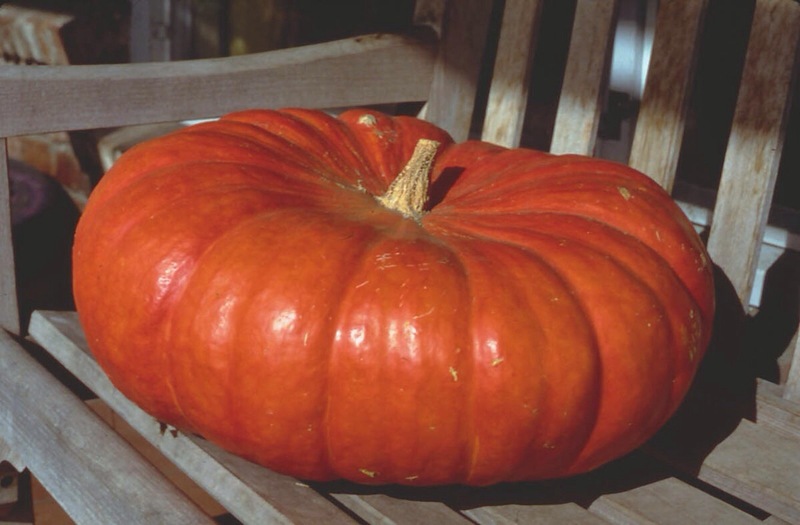 Rouge Vif d’Estampes – makes a great pumpkin ale! Give it a try! 1 Comment Posted in Ale, Beer, Homebrewing, Local Breweries Tagged 805, ale, Beer, Pumpkin, Shipyard Brewing Co.
Lengthwise – More & More! It has been a while since I last visited. 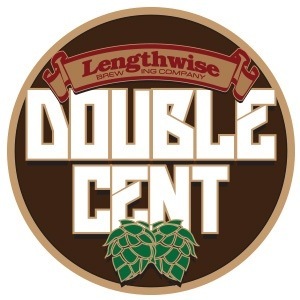 Lengthwise is broadening their offerings and I am pleased with the efforts! 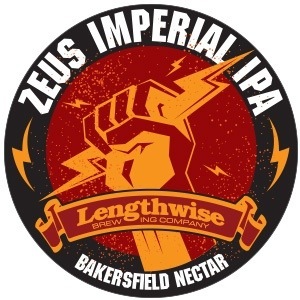 I am an IPA fan and they have a Zeus Imperial IPA that looks awesome! Zeus hops in the boil and dry hopped with Citra. Sounds incredible! If you understand what I have just written you noticed that I did not quaff the beverage! I will have to return somewhere down the road! If in Bakersfield try out their offerings, you won’t be disappointed! I have sampled the Double Centennial on previous visits. It is one of my absolute favorites!